Facebook introduced embedded Post in July to make it easy for publishers to add any public post from Facebook to their blog or web site. Embedded Posts are available to everyone. Embedded Posts are a simple way to put public posts – by a Page or a person on Facebook – into the content of your web site or web page. Only public posts from Facebook Pages and profiles can be embedded. Embedding Facebook updates on your website can help you increase visibility and engagement. To start, visit your Facebook business page, and make sure you’re logged in as an admin of the page. Choose a post that you’d like to embed and then click the drop-down arrow in the top right corner of the post. Then click the “Embed Post” link. When you click on this, you’ll get a popup showing how the post will look and the code to use. Copy this code and paste it where desired on your website or blog. There are two ways you can add the embed to your site. You can add the code you copied/pasted directly to your site or you can use Facebook’s Code Generator to adjust the size of the embed and generate a more custom piece of code. Once you have the embed on your site, you can add other Social Plugins to your website, like video embeds or Facebook comments. 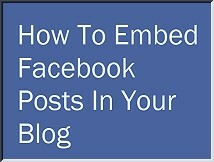 Embedding posts on your site is a great way to drive website traffic to your Facebook page. Note: Only public posts from Facebook Pages and profiles can be embedded. Post by SeashoreWeb Social Media Marketing.